July 2013 – Iowa is now home to 81 wineries according to www.Iowawineandbeer.com. I am in Iowa City for one week to attend the Summer Writer’s Festival, but had a free afternoon and morning to visit some of the local wineries and the unique Amana and Amish communities’ near-by. All are within a 20 or 30-minute drive of Iowa City. In the afternoon I drove to Cedar Ridge Winery first because it has the largest vineyards in the area, boasting 10 acres of 10 different varietals. The winery itself is also big by Iowa standards, producing 15,000 gallons of wine per year (6250 cases) and 15,000 gallons of spirits (rum, gin, vodka). They are located just a few miles off of 380 south of Cedar Rapids. The tasting room is large and impressive, set up on a hill with a view of the vineyards. They also have a restaurant, which serves wood-oven pizzas and prime rib several nights a week. I was traveling with Peggy, a colleague from the Writer’s Festival, and we were immediately welcomed when we walked in the door and allowed to taste all 17 wines available with no tasting fee. Iowa law also allows visitors to taste up to 3 spirits. The winery specializes in grapes that grow well in the mid-west, but supplements these with purchased grapes from Lodi, California and the Finger Lakes region of New York. Some of the Iowa grapes include: La Crosse, La Crescent, Brianna, Edelweiss, Frontecnac, St. Pepin, St. Croix, and Marchel Foch. My favorite whites were the La Cross, La Crescent, Brianna, St. Pepin and Frontecnac Gris – the latter two being dessert wines. Interestingly none of these wines have vintage dates. My favorite, and the one I purchased, was the Cedar Ridge La Crescent ($16.99). It has a lovely floral nose of apricot and honeysuckle, which carries through on the palate but ends with a bracing grapefruit acid, which I loved. La Crescent is actually a hybrid grape that is a cross between St. Pepin (v. ripara) and Swenson, which is related to Muscat. It is extremely cold hardy and can withstand temperatures as low as -36 F. My second favorite was the Cedar Ridge Winery Brianna ($12.99), which was like biting into a ripe pineapple with a touch of banana on the finish. A true tropical bombshell, but delicious. The outstanding reds were the Cedar Ridge St. Croix ($12.99) which was a lighter style red similar to pinot noir and the Cedar Ridge Marechal Foch ($16.99) which had more complex earth and berry flavors with good tannin structure. They also make a pretty decent cab from Lodi grapes, but I wasn’t in Iowa to taste Lodi. After the tasting, they allowed us to go into the winery and see the bottling operation, which was in process. I also was granted permission to wander through the vineyards and encountered a man who was hedging the vines with a chainsaw. Well, that’s one way to do it! All together, a very pleasant visit to Cedar Ridge. I just wish we would have had time to sit on the patio, order a pizza, and drink some wine. After Cedar Ridge Winery, we drove about 15 minutes south through the cornfields on very small paved roads until we arrived at the Amana Colonies. These are a group of 7 villages settled by Germans in the 1800’s who wanted to created an “inspirational socialist” community. They each have individual houses, but do communal dining and farming. What is especially nice about the Amana communities is they brought their winemaking skills from Germany, but were forced to apply it to dandelions and rhubarb. They have since expanded to other fruit, including grapes. I visited Ackerman Winery where they have 22 different wines, and tried the two whites made from Iowa grapes, but they were not exceptional. What was excellent were some of the fruit wines with the cranberry and raspberry really standing out for me. They also have a nice self-guided tour and are located in the middle of the charming town of South Amana. Interestingly every wine, except the merlot ($11.95), is $9.95 a bottle. In addition to Ackerman’s, South Amana is filled with wonderful shops and restaurants. Peggy and I had an enjoyable time stopping at the visitor’s center, and then going to a variety of stores. The furniture shop with beautiful handcrafted wood furniture and grandfather clock’s was especially nice. We also visited the woolen mill and the general store where I was able to pick up a variety of gifts. Later we had an excellent German dinner, served family style, at Ronneburg Restaurant. I had the pork chop with apples and sauerkraut, which was locally produced and seasoned – exceptional. White Cross is a relatively new winery, which is located in downtown South Amana. They have a darling tasting room with very friendly service and offer tastes of 10 wines for free. The winemaker specializes in blending other people’s grapes and fruit, and produces his wine as custom-crush at Cedar Ridge Winery. He also purchases grapes from Cedar Ridge. I was most impressed with the White Cross Cellars Chateau Blanc ($13.95), which was a blend of La Crescent and Chenin Blanc. It reminded me of a semi-sweet Loire wine with peach notes and crisp acid. Another favorite was the Cranberry Bog ($12.95), a semi-sweet wine made from cranberries and apples with lots of spice. The next morning I left Iowa City to drive to the town of Kalona, the headquarters of the largest Amish community in Iowa settled in 1846. The minute I turned into the town, a horse-draw buggy approached me. Soon, I saw them everywhere! They even have special lanes on the road for the horses and carriages. Every buggy was black with one large horse pulling it, and most were manned by men wearing old fashioned overalls and long white beards. The Amish are originally from Switzerland and came to America so they could practice their religion in peace. They do not believe in amassing material goods and live simply with no electricity, running water, or school beyond the 8th grade. Everyone dresses in old-fashioned clothes, which they make themselves. All food is produced on their farms. Wine and other forms of alcohol, however, are not allowed. Driving down gravel roads, I passed many Amish farms with black carriages parked in barns surrounded by horses and goats. At one farm, I saw a small boy and girl driving a horse and buggy, and then a whole family came trotting by. As I turned a corner, a teenage Amish girl was standing barefoot in the grass near a wooden fence. She was dressed in a long blue home-made dress with a blue bonnet covering her hair. She looked up and smiled at me, and I could see she had large blue eyes in a red sun-burned face with pale lips devoid of any make-up. I stopped at the general store, which had a sign stating, “We request our customers dress in a modest fashion.” It was like stepping back in time to shop in the store filled with bolts of materials, cooking pans, shoes, and flour and barley sold by the scoop. Later I stopped at the cheese factory and sampled some wonderful curd. Just before I left, I encountered a man in a carriage with his horse coming towards me down the road. He stopped, tipped his hat, and said good morning. I responded in kind and then asked if I could take a picture of him. He smiled politely and said, “I would prefer not.” Apparently the Amish are very photo shy so I thanked him and wished him a good day. The whole experience of driving around Amish country for an hour left me with a feeling of awe. The minute I entered the area of gravel roads and large farms, a sense of peace descended upon me and I felt very happy. The Cathars were an usual sect of Christians who were vegetarians and believed in reincarnation. Some of the ancient rumors – picked up by Dan Brown in his book, The Da Vinci Code and those following – suggest that Jesus Christ actually came to this region of France with Mary Magdalene and taught the local people Christianity with a splash of Buddhism based on his travels through India. Whether this is true or not, the Cathars thrived for hundreds of years until they were exterminated by the church as heretics in the early 1300’s. The Knights Templar, also originally from this region, met a similar fate around the same time period (1314) when the Church decided they were becoming too powerful and had many of the tortured and killed – even though they protected many Christians on their journey to the holy land. 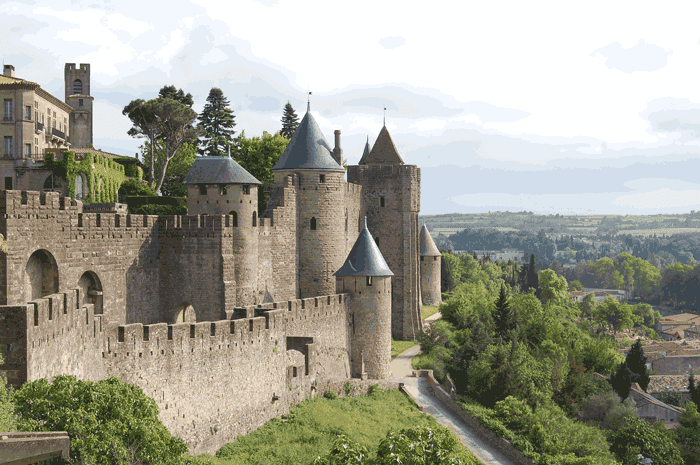 The main legacy of the Cathars is a series of beautiful medieval castles and cities throughout Southern France – the most famous of which is Carcassonne. I visited here several years ago and wanted to take my family to see the oldest intact medieval city in the world. It is truly amazing the first time you see it from a distance rising up with its many tower, turrets and great double walls. From our apartment in Collioure, it took 1.5 hours to drive to Carcassonne on A9 – toll freeway. We arrived early – around 9:50 and were able to find parking close to the entrance. The city itself is free to walk around, but you must pay for parking as well as the chateau tour – should you decide to take it. We wandered the narrow streets of the amazing medieval city, stopping to shop in the many stores filled with knight and princess gear, complete with swords. When we arrived at the church, we were blessed to encounter a group of monks singing in harmony that echoed beautifully off the ancient gothic walls. Later we climbed the outside walls to the ramparts and gazed out across the new city below, and then stopped to have an apricot crepe. There are many restaurants in the old city serving cassolette – the specialty of the region – several providing small delicious samples to tempt you. In hindsight, we should have stayed there to eat lunch, but we decided to push on towards Limoux. 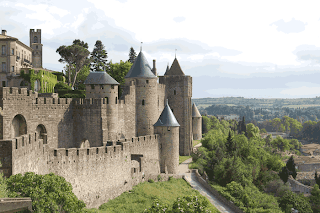 We left Carcassonne around noon to drive to Limoux (20 kilometers away). I assumed that since it is such a world-famous wine town that it would be beautiful and set-up for tourists. Unfortunately none of this is true. Limoux appears to be run down and neglected as if no one has spent any money on the town for decades. Yet in terms of wine regions, it is so old and famous, I’m surprised they didn’t qualify for a Unesco world heritage region like Tokay in Hungary. Regardless, we wound our way through the confusing tiny streets towards “Centrale” – never once seeing a sign for the tourist office. Eventually we encountered the main square with a beautiful fountain with no water. It started to rain and became even more depressing. However, we made our way to a small café called La Concept. There we encountered very friendly service, free internet, and huge, comforting bowls of cassoulette filled with beans, pork, and duck. I had this with a small coup of Blanquette – not a great match, but it was still quite lovely. After lunch we pulled our umbrellas out and went in search of the tourist office. We found it half an hour later hidden in a back corner of the town. Once more we encountered much warmth and friendliness in the tourist office, and left with directions to several wineries and many brochures. After getting lost several times, we finally arrived at L’oustal Anne de Joyeuese Winery just outside the old town. This was one of those recommended by the tourist office. Again we found a very friendly staff, and I was able to taste 3 sparkling wines, though I was hoping for more. Later I found they did have more, but it was a communication disconnect. Turns out the place is a large cooperative and they seem to specialize more in dry still wines with many merlots, cabs, and syrahs – as well as gasoline-type pumps of white, rose, and red wine sold by the liter and pumped into your own container. Very amazing by US standards. Of the three sparkling wines I tasted, the first was a NV Blanquette de Limoux (6 euros), which by law, must contain at least 90% Mauzac grapes, but can also include chardonnay and chenin blanc. The Mauzac grape is unique to the region and has a fruity, yet musty taste. It is supposedly the grape that was used when sparkling wine was first discovered in Limoux by a monk in 1531 – several years before Champagne. Because of this Limoux is considered to be the home of the oldest brut in the world. They still make wine here using the Methode Ancestrale, which involves fermenting the grapes in tank/barrel and then transferring to a bottle when there is still sugar left in the wine. Once in the bottle, the wine starts a secondary fermentation – usually in March when the weather warms up and the yeast left in the wine start consuming the sugar. This results in a sparkling wine which may still be a little sweet and has a low alcohol – around 7%. The second wine I tried was a Limoux Cremant, which by law must contain a minimum of 40% chardonnay and 20% chenin, but no more than 90%. Other grapes which may be added include Mauzac and pinot noir. The cremants are made using the traditional method (also called methode champenoise) which includes secondary fermentation in the bottle but only after the base wine has been fermented to dryness. Sugar and yeast are added to create the bubbles, and a final dosage determines sweetness level. The Cremant I tried was very lovely and well priced at 6.50 euros, but my favorite was a 2008 Vintage Antech Heritage Brut Millesime Cremant de Limoux for 10 euros. It was very creamy with tiny bubbles and a toasty flavor with light pear notes. I ended up buying two bottles, and wishing I had more time in Limoux. The next time I visit, I must make advance arrangements so I can experience a proper tasting and visit the vineyards and cellars. Afterwards we drove 20 minutes to the mystical village of Renne le Chateau. This is high in the mountains along the Route of the Cathars, and attracts many tourists because of its stories of lost gold, Templar Knights, alien spaceships, a corrupt priest, and the last hiding place of Mary Magdalene and her four children. It is perched on a high hill with magnificent views in all directions. It had stopped raining and turned blue and sunny when we arrived, so we wandered around the few small shops and visited the Church of Mary Magdalene with its unusual devil carving. It is a very special place, and definitely worth a stop. Also, several very cute looking restaurants in town. Next time I would prefer to eat lunch here. We continued down the Route of the Cathars along the river Aude and found the road to be more twisty as we headed deeper into the Pyrenees on our way back towards Perpignan. At some places the rock wall came down so far over the road that large trucks had to stop and back up in order to pass. After driving about an hour through charming little villages we came to Maury – another famous wine village for Vin Doux Natural (sweet dessert wines with fermentation stopped by the addition of alcohol – usually 15.5%). We stopped at Les Vignerons de Maury – another cooperative, but an excellent one with a professional tasting room, large displays and very capable staff. 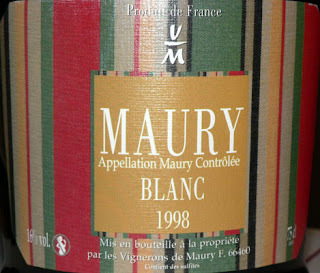 We started with the AOC Maury Blanc which seemed very sweet and simple. Next we tried the AOC Maury Ambre which was one of my favorites. It was made of white Grenache but oxidized so that it tasted of dried apricots, orange and carmel. The price of 7.80 euros for a full bottle was amazing. I also tried a Rancio tuile version which was even more complex, but I ended up buying a half bottle (so it would fit in my luggage) of the Vendange 2011 AOC Maury Grenache for 8.50 euro. It was a deep ruby red and tasted of fresh berries and spices. The vineyards of Maury are farther inland from the ocean compared to Banyuls and appear to be on flatter land (not the steep terraced slopes of Banyuls). 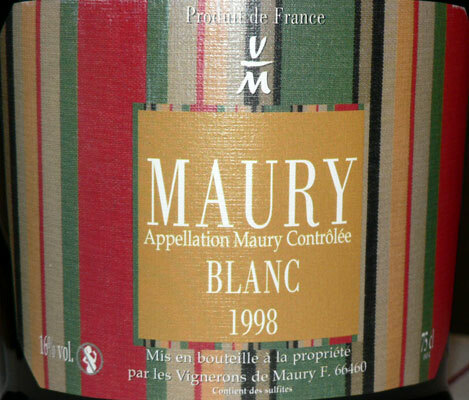 Some experts say that because of this Maury wines are bigger and more tannic than Banyuls. A short time after Maury we reached A9 and were back in Collioure by around 6:30 so we stopped in the town and had a pastis on the beach before heading back to our apartment. For dinner we had a quiche Lorraine, salad, and of course, more cheese, salami and wine.